BDS, the boycott, divestment and sanctions campaign against Israel, dishonestly brands itself as a human rights movement, and speaks of justice for the Palestinian people. Some supporters of BDS may genuinely believe that BDS will encourage Israel to change its policies by withdrawing from the West Bank and that peace will ensue. However, BDS obfuscates its primary objective, which is nothing to do with a change of policies and everything to do with the demise of Israel itself. While BDS claims to be agnostic on whether it supports a one state or two state solution, its stated goals, website (www.bdsmovement.net) and leading proponents all tell a different story. The realisation of BDS’ stated goals would mean the Jewish people are denied their universal right of self-determination, a right guaranteed to them by international law. BDS demands that all Palestinian “refugees” be allowed to live in Israel. Under UNRWA’s definition, Palestinians are the only people in the world who inherit refugee status, so that the number of refugees keeps growing. According to the BDS’ website, there are 7.25 million “refugees”, the majority of whom have never, and whose parents have never, set foot in Israel and many of whom are denied citizenship in the land of their birth, such as Syria and Lebanon. If they all lived there, Israel would cease to have a Jewish majority, and would no longer be a Jewish homeland. Barghouti openly calls for one state encompassing the lands of Israel, Gaza and the West Bank, where only Palestinians will have the inalienable right to self-determination. The BDS website relies on and perpetuates a false narrative, accusing Israel of “settler colonialism”, and attacks the very notion of Zionism, the Jewish people’s right of self-determination in their historic homeland. Under this narrative, Jews are usurpers who have stolen, and continue to steal, land off the Palestinians, which it claims to be the indigenous people. BDS does not and cannot acknowledge Jewish historical, moral and legal claims on the land. There is no recognition that the legal instrument guaranteeing Jewish rights to settle in between the Mediterranean Sea and the Jordan River, as adopted by the United Nations, is still in force. It ignores the fact that the only sovereign state to ever exist in the land has been a Jewish one, and there has never been a sovereign Palestinian state. It denies that the Jewish people originated in and are the indigenous people of the land (as incontrovertibly proven in archeology, history and genetics), that they have a millennial-long connection to and yearning for the land, and have always had a physical presence there, under successive occupations. BDS does not countenance even one Jewish state in the world. Instead, it advocates for a 51st Muslim-majority country, which, judging by history and the statements of BDS and Palestinian leaders, would inevitably lead to the ethnic cleansing of Jews from the land. If BDS were truly about international law and human rights, it would recognise that international law guarantees the existence of a Jewish homeland and that Jews also have human rights. Instead it delegitimises the very idea of a Jewish homeland and those who support it, and even a Jewish presence in the land. There are countless states that have questionable origins, wars, colonialism, changing borders, refugees, genocides, destruction, racism, despotic regimes and theocracies. However, there is only one state, the one Jewish state in the world, whose very right to exist is questioned and labelled as a racist endeavour. There is only one people in the world, not the Japanese, not the Serbs, not the Muslims of Pakistan, not any other people, who are denied the right to a homeland and to determine their own destiny and direction. If BDS was a true human rights movement we might expect it to have something good to say about the one state in the Middle East where women have the same rights as men and Arabs can vote in truly free elections, that holds Pride Parades, and has an independent judiciary, rather than calling for its destruction. BDS does not call for an end to trade with China, despite its human rights record and oppressive occupation of Tibet, nor protest against Turkey, despite its crackdown on media freedom, occupation of Northern Cyprus and Armenian genocide. BDS also says nothing about human rights abuses inflicted by Palestinians against Israelis (in particular, through ongoing terrorism). It can’t even honestly purport to be concerned for the Palestinian people, because it says nothing of the massacre and ethnic cleansing of Palestinians in Syria (according to the London-based Action Group for Palestinians of Syria, 3,722 Palestinians (have been killed since the start of the civil war) or the fact that Palestinians are prohibited from several professions in Lebanon, or the corruption of the Palestinian Authority, or the treatment of women in Gaza under the Islamist regime of Hamas. It reserves its opprobrium for Israel alone, and on spurious grounds. The call for a boycott is premised on the questionable basis that boycotts caused the demise of South Africa’s apartheid regime, and on drawing a parallel between that regime and Israel. While, like most other countries, Israel has work to do improving race relations, it is the only country in the Middle East where Arabs (1.5 million of them, both Christian and Muslim) and Jews vote and sit in Parliament together, sit on the Supreme Court, have the same constitutional rights and openly practise their religions, should they so wish. Arabs are well represented in academia and the professions. By all objective measures, they have a far higher standard of living, better healthcare and educational opportunities than in neighbouring countries like Syria, Egypt, Jordan and Lebanon. Despite this, BDS supporters regularly accuse Israel, and only Israel, of apartheid. In the West Bank, an area which Israel gained control of after Jordan attacked it in 1967, the situation is more complex. There are different areas of administration and systems of governance in the West Bank, which were agreed by the parties in the Oslo Accords. The Arabs who live there are not citizens of Israel and come under the administration of the Palestinian Authority. They have remained that way, pending a final status agreement. They have their own legal jurisdiction and set of laws, enshrined in the Basic Law, which, founded in Islamic law, is intended to operate much like a constitution. They have not had elections since 2006, because of disagreements between the main parties, Fatah, the ruling party in the West Bank, and Hamas, which governs Gaza. Their parliament was disbanded in 2007. In 2016 the municipal elections in the Palestinian territories were suspended indefinitely, again due to the power struggle between Hamas and Fatah. The fact that Palestinians do not vote in elections and do not have rights equivalent to Arab citizens of Israel and their Jewish neighbours, is not because of apartheid, but because, like Gaza and other neighbouring Arab states, and despite billions in aid, their leaders have failed to embrace democracy and the rights that go with it. Accusing Israel of apartheid, a term that rightly evokes revulsion, is nothing more than emotive sloganeering that casts a slur on many millions of Jews (and others) around the world who support Israel. It creates a moral imperative to rid the world of Israel and its supporters, but belies the facts and complexity of the situation. The reality is that there are two imperfect parties to this conflict – Jews and Palestinians – with competing claims. Peace and justice for both parties will only come when they acknowledge each other’s claims, have dialogue and negotiate. But dialogue and negotiations are eschewed by BDS – they are the very antithesis of the BDS platform, which promotes segregation and isolation of Israel and Israelis. BDS supporters never acknowledge the numerous offers that the Palestinians have turned down for a state. The most recent example is in 2008, when Israel offered a near-total withdrawal from the West Bank — proposing that Israel retain 6.3 percent of the territory in order to keep control of major Jewish settlements – with land swaps equivalent to 5.8 percent, and a link to the Gaza Strip. The Old City of Jerusalem was to be placed under international control.The simplistic, mendacious BDS worldview is that Israelis are a monolithic people who are uniquely evil in the world, and who do not have legitimate rights or security concerns, while Palestinians are victims who are beyond reproach and should not be held to account for their decisions or actions. BDS aims to bully and blackmail Israel and people who don’t subscribe to the BDS worldview, in the hope that Israel will succumb to pressure and unilaterally agree to BDS’ demands, bypassing the need for negotiations and compromise on the part of Palestinians. BDS supports a boycott of all Israeli goods, not just those of settlements, but beyond that it does not define exactly who should be targeted with any specificity. It extends to international companies who are “involved in the violation of Palestinian human rights”, an amorphous concept at best. It encourages “the principle of context sensitivity, whereby activists in any given context decide what best to target and how”. It does not suggest boycotting Intel, which invests in Israeli companies and has strong ties to the Israeli economy, because that would mean not being able to use computers, nor does it suggest not using Israeli-developed medicines. In other words, followers are able to pick and choose, in order to maximise grand-standing opportunities and damage to others, and minimise inconvenience to themselves. BDS seeks to collectively punish, blacklist and discriminate against individual Israelis, such as tennis players or performing artists visiting New Zealand, regardless of their political views, and those who deal with them. Roger Waters, one of the chief proponents of the “artistic boycott” against Israel regularly intimidates and shames artists who exercise freedom of choice to perform in Israel. Recently, the young New Zealand artist Lorde felt compelled to cancel her concert in Tel Aviv, due to a social media campaign that accused her of complicity with Israel simply through performing there. She is still to perform in Russia. Through its bullying tactics, BDS supporters aim to deny people who do not subscribe to their one-sided, hypocritical, fraudulent worldview, their freedoms – freedom of speech and thought, academic freedom, freedom of association and freedom of commercial activity. There is a word for that. Fascism. 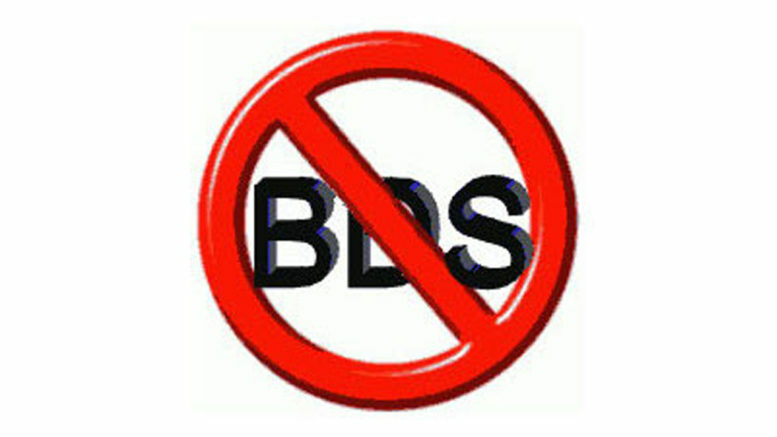 BDS was established by the NGO Forum held during the World Conference against Racism, Racial Discrimination, Xenophobia and Related Intolerance in Durban in September 2001. The NGO Forum was overtly antisemitic. During a BBC interview, Mary Robinson, then UN High Commissioner for Human Rights, said of the conference that “there was horrible antisemitism present — particularly in some of the NGO discussions.” Because of this taint, and the fact that the campaign had failed to make any ground, it was re-launched in 2005 as a call from Palestinian civil society, in order to gain credibility. BDS meets the US State Department’s and the European Union’s definitions of antisemitism on several grounds. According to those definitions, denying the Jewish people universal rights, and applying double standards to their homeland, is antisemitic. UN Secretary General Guterres, among many other world leaders, has said denying Israel’s right to exist is a modern form of antisemitism. Further, BDS advocates frequently employ language, narratives and tactics to demonise the world’s one Jewish state that have traditionally been used to demonise the Jewish people. In Germany, cities including Munich, Berlin and Frankfurt have banned using public spaces and municipal funds for BDS. Uwe Becker, deputy mayor of Frankfurt, stated that BDS uses the language “that Nazis once used” in their messaging and that it is “deeply antisemitic”. German public broadcasters have dropped plans to broadcast the concerts of Rogers Waters later this year, over concerns about antisemitism. Waters has compared the actions of the Israeli government in relation to the Arab Palestinians to those of Nazi Germany, a ludicrous statement which is designed to demonise the state of Israel, while trivialising the Holocaust. BDS perverts and appropriates the discourse of human rights, while insidiously delegitimising and demonising the world’s one Jewish state and those who are accused of complicity with it, and denying history. Ironically, the hateful environment it fosters, on campuses, in the media and elsewhere, serves as a reminder, should one ever be needed, as to why the Jewish people deserve and need their own homeland, and why they will never cede their self-determination to tyrannical bullies. BDS is a smear campaign against Israel. BDS lies about its agenda, and its respect for human rights and international law. It tells those lies because if people knew the truth, they wouldn’t follow it. Don’t be fooled by it.